Kishan Patel thought for a moment before answering the question his high school golf coach had asked him. “I don’t know,” Kishan replied. Kishan Patel at the University of California, Davis. Three years ago Kishan didn’t realize the importance of the conversation he had with his coach, but from that moment on, he applied those wise words to so much more than golf. In 2014, Kishan was selected to receive a Youth on Course scholarship. This spring, he will graduate a year early from the University of California Davis with a degree in Neurobiology, Physiology, and Behavior (NPB). Looking at his brief but successful time in college, it is easy to see how Kishan applied his coach’s advice to every opportunity that was presented to him. 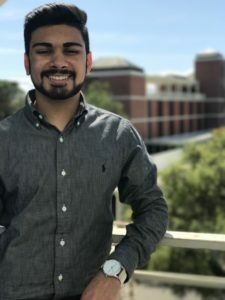 In his freshman year at UC Davis, Kishan and a friend found their “next shot” and jumped on the opportunity to make a difference. 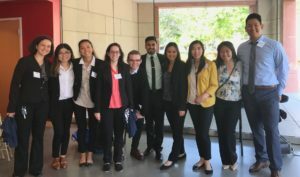 They noticed that a large portion of pre-health students, themselves included, didn’t have mentors or the resources to help them navigate the difficult and confusing pre-health process. Eager and determined to make a difference, they created the Pre-Health Ambassador Network (PHAN). PHAN ambassadors and volunteers at the first annual UC Davis High School Pre-Health Symposium. PHAN has been wildly successful at UC Davis thanks to Kishan’s dedication and can-do attitude. Just this April, PHAN hosted the first annual UC Davis High School Pre-Health Symposium that attracted hundreds of high school students interested in getting a glimpse at what their pre-health future holds. As for golf, Kishan still finds time to enjoy his release from school at the range on his occasional weekends at home with his family.